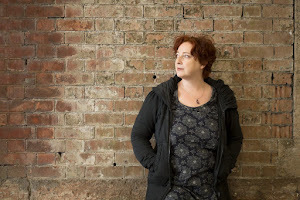 Next week will be something of a short story theme week on Vulpes, with some old favourites, some twentieth-century classics, something brand new, and a guest piece from Tania Hershman, short story buff extraordinaire. I love that. No idea what it means or how exactly I qualify... I don't feel like a "buff extraordinaire", I feel like someone who is desperately trying to catch up after all those years at university spent memorising equations rather than reading great literature but still knowing she has a long way to go. Well, anyway, my post will be up on Wednesday, and I hope it might prove a little provocative but mainly inspirational. We'll see - more about that in a few days. Well, I still haven't got my copy yet, and so I am preparing myself for the fact that tomorrow, the day my book is officially available, I won't actually have it. And that will be ok, right? Yes, it will be fine. 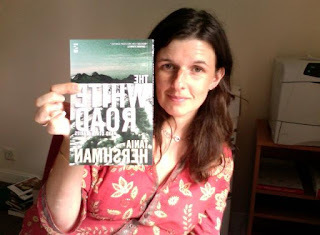 As Nik says, nothing can diminish the joy of holding the book for the first time, no matter what day you receive it on. I am busying myself with the website, doing last minute tweaks etc... And not sleeping much. Not really. The heat. The excitement. I would like to sleep. Soon. My Amazon ranking, which is still a complete mystery, has now strangely lept up to 34,957 from somewhere in the 150,000s. Gosh, if there's so much activity before publication, I can only imagine what will happen tomorrow! it's out there already! Vanessa posted this great picture on her blog today, and Pierre L commented that he already has his copy too - thank you, Salt, and thank you to both of you for wanting to buy my book, it is not something I take for granted, it is something I appreciate enormously. It feels strange that other people have it there and I haven't seen it, haven't touched it. Soon, I hope! T-3.... and isn't this a great idea? 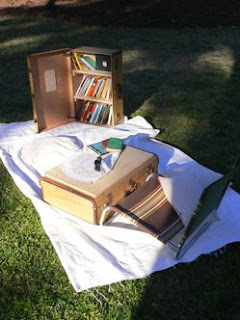 Book Case is a temporary public reading room that travels in a suitcase (or two). Its collection consists solely of material that can be read in a single sitting - zines, anthologies, essay collections, short stories, poetry etc. - and changes according to each new location it appears in. Readers are encouraged to interact with each other via index/correspondence cards in each book, or by old-fashioned conversation in the reading room surrounds.Book Case has had two separate outings so far, and is looking to travel to other events or festivals populated by people who like to read. Its collection (and accumulated readers’ notes) expands with each appearance, and can be tailored to suit any given event. Alternatively, if you would like to commission Makeshift to produce your very own travelling Book Case, please contact us.Donations of appropriate short-format reading matter are always welcome and much appreciated. After my second book of stories was published, I felt there was no place for me to be entering comps anymore. A healthy discussion ensued about whether, after a certain level of success has been attained (one book published, two books...), a writer should step back and stop entering competitions. Or, on the other hand, since competitions are excellent ways for short story writers in particular to earn the money that their books are never going to bring in, should it just be Best Writer Wins, regardless of pedigree/level of fame? I bring this up today because I just received an email from Narrative magazine announcing the winners of their First Person Story Contest: first prize goes to Gina Ochsner. Now, Gina Ochsner, a very fine writer, has published two short story collections and I see her name in many literary magazines, including the New Yorker. I don't doubt that her prize-winning story is worthy of the prize - but my questions would be, Should she still be entering these comps, given that she doesn't need the exposure/fame as much as some of us? The $3000 first prize is, of course, wonderful, and I don't begrudge her at all. But this is an ongoing topic of discussion, I think, and a worthy one. What are these competitions for? Who are they for? To be honest, this puts me off entering Narrative's new competition (details here), I feel like its out of my league and I shouldn't even bother. (This is not me asking for validation that I, too, am worthy... don't worry, my ego is intact!). 4 days to go and I am throwing myself into preparing the Sept issue of The Short Review, which will (most probably) come out next Thursday. I always try each month to mix it up, a bit of this and a bit of that, but, magically, whatever I do, themes seem to appear across all the reviews. It's fascinating, I learn so much from my reviewers' takes on the books, what works for them and what doesn't - and I love reading the author interviews (six in the coming issue), finding out how they put their books together, how it feels to know people are buying them. Yes, I really only set The Short Review up for my own edification and entertainment! 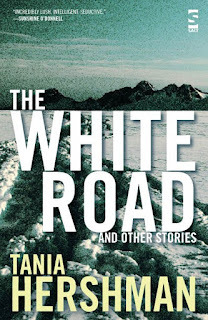 In other news: the Amazon ranking for The White Road shot up from 300,000 or so to 59,326 overnight. What does this mean?? I mean, they're not selling it yet, so how does this work? No idea. 'Prison Break' Shocker: Dr. Sara Tancredi Lives! Last year, Prison Break star Sarah Wayne Callies got into a contract dispute which ended in her character's untimely death. Fans of the television show were outraged, particularly at the way Dr. Sara Tancredi was killed. Early on in season 3, Lincoln was shocked to find Sara's head in a box, courtesy of The Company. She was killed after Lincoln attempted a daring rescue attempt to free her as well as his son, LJ. Well, Prison Break fans, all is not what it seems. TV Guide released a huge story today from columnist Michael Ausiello and Prison Break executive producer Matt Olmstead that says: Dr. Sara is still alive and returning in season 4! Well. That changes everything. I might have to go back to Series 3 and carry on. You just never know what life is going to throw at you next, eh? 5 days to go.... it's in print! Seeing this, it feels a bit like she's holding my baby and I haven't got to hold it yet! I just sat in the garden and had a naughty cigarette, grinning to myself! Any day now. Wheee...! Ok, off to my writing group, where I may actually do some, yes, writing. So, the first change: when you click "buy it now" on my Salt author page, you don't get "This product is not yet available". You get this. Very exciting. 6 days to go...and I have found Wordscraper! My most heartfelt gratitude and undying love to Sara, who introduced me to Wordscraper on Facebook, basically the Scrabulous' creators dodgy way to keep Scrabulous by another name, and slightly alter the rules. Yay! Distraction is back! Now I can write....I feel so relieved. Just had an email from my lovely publisher, Jen, at Salt. The books arrive today, and she'll zip me over a copy so I can wake up with it on Sept 1st. Can't wait. It's real. It's really real. Ok, shut up. I also sent her the list of 15 or so very wonderful people who have asked for/agreed to receive review copies in order for them to say something about my book, including the already-mentioned and always-fabulous Sara (Sara, today's blog post is all you you you). I am deeply thrilled at the prospect of reviews, but also curious and nervous to see what they might say. I don't expect all of them to like all of it, or even some of them to like all of it... I think I'd even be disappointed if the reviews weren't in some way less than positive. I encourage my Short Reviewers to be honest, fair, balanced, and several authors who have received these sorts of reviews have written to thank me, and the reviewer, for the honesty. I believe myself - pre-review - to be one of this kind of author, and would like the chance to find out. Bring it on! 7 days to go... and no distractions...help!! Ok, this is a disaster. After I come up with my amazing theory about the power of Scrabulous on Facebook to help me with my writing by distracting my demons, it's gone. Scrabulous. Shut down. Suddenly, Saturday night, I log in to carry on the games I was playing. Nothing. My fingers are itching and twitching, and there's nothing I can do! So, ok, I decide to turn to other distractions... namely, Prison Break. I had just started Season 3. I really enjoyed the first two seasons. Then, this morning, a few episodes in, the love interest is suddenly killed. Beheaded, in fact. And I thought, Oh come on! That's it for me. I can't watch any more. It was preposterous anyway, but this was just plain ridiculous. It was done so badly, no lead up, nothing. I really liked her. So, no more Prison Break. What's a girl to do now? I am trying for a sugar-free week, so chocolate is out. Blogging, thankfully, is still an option. I need some escapism, I can't just write and think about writing ALL day... and this week, with 7 days to go til P-Day, I was going to take it easy, not put too much pressure on myself to work. Now what? I greatly appreciate someone like Toby, who is busy promoting his own books, taking the time to read my stories and to encourage a beginning author who is just stepping onto the path. I only hope that if I am in a similar position, I will be able to be as generous with my time and my words. 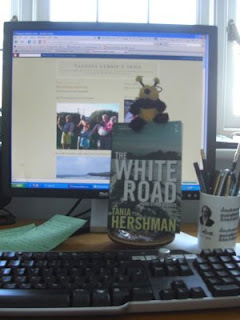 I've just realised that The White Road and Other Stories is going to be published in 11 days. 11 days. I am not sure what to make of that. I have a strange tingling, vaguely nauseous feeling in the pit of my stomach. And, also, I am grinning. Different parts of my body are reacting in different ways. This isn't like seeing my name in a magazine, or online. What is it? Sadly, I won't be able to dash down to my local bookstore on September 1st and touch my book, pull it out of a shelf, hold it to me. I probably won't see a copy until my trip to England in mid-September. So what will happen exactly on Sept 1st? Well, I guess for one, the Buy Now button on my Salt author page won't say "Sorry, this product is not currently available." And on Amazon, it will be like all the other books. It will be available, published. But surely something huge will happen on Sept 1st? Will I wake up and feel different? Will I make my morning cup of tea as a Published Author? Will the cats know when I feed them? I don't have a launch party planned yet... because I am not sure when the books will arrive here. It probably won't be until mid October. That's a long time. It won't be the same then. It won't be Sept 1st. What will it be? I am not worried, what will be will be, and I have already seen how I react to things that are supposed to make me jump for joy. That's ok. But I think I should do something on Sept 1st. I should mark it as a milestone on the road, a shift, a waystation. Any ideas? I don't like champagne.... shame! I don’t pretend to know anything. I am not that kind of master teacher where I know something and transfer that knowledge to students who don’t know. Instead, I guess, I teach curiosity. I try to create in the classroom interesting environments and then, with the students, discover things that, perhaps, we already knew or know but didn’t know we knew. I think my other job as a teacher is really to resist the bias bred into the institution where I am housed. A university is by nature a critical institution. I want to resist having my students learn to be critics. Instead I want to inculcate the habit of writing and in doing, so I think one has to defuse the tendency to judge quality of work, to even resist asking the question, “Does this work?” Students come to me ready to think of the classroom as a place of battle. They have already been naturalized into thinking that a workshop, say, is a simulation of the way the world works. You write something and an editor or reviewer beats up on it. So students have come to think of workshops as a way to create calluses, to out-think the critics. Instead, I like to invite them to remember the intrinsic pleasures of the business, the act itself of sitting down and writing, not the ritual of self-sacrifice. My students’ writing have, for a long time, been quite timid and, as they love to say, traditional. The many classes many of them have taken have led them into an aesthetic that is by design static. The realistic narrative—once a highly experimental form—has produced a series of stylistic rules that can be taught and my students have learned—don’t use exclamation marks, underlining, or any graphic measure to intensify emotion, for example. Those kinds of rules are set in stone. What is to vary realistic story to story is the content, the local, the details. You can in that kind of aesthetic do things wrong. And the critical institution we work within loves that kind of knowledge. I have seen recently more and more students attempting fiction outside that particular drama. More interest right now in the fantastic, irreal, the magical. Also a growing interest in more things lyrical, meditative, associative, and less linear. I like the way Martone talks about teaching. Workshops can, I have often felt, become, as he says, "places of battle", with a great deal of "this doesn't work" and "this is wrong". I know friends who recently completed an MA in Creative Writing where one tutor's idea of a comment was "This is unpublishable". I don't think that is helpful. Or necessarily true. Martone's own fiction is wonderfully irreal, non-linear. His collection, Double Wide Fictions, is waiting on my shelf to be read, a real treat! My flash, Sweet Music - a Mslexia reject, thank you Mslexia! - has just been published in the excellent and beautifully redesigned Literary Fever, with a wonderful illustration by Tanya Pshenychny - a double Tania/Tanya offering. And for the second day running, I am in the excellent company of my writing pal Sarah Hilary, whose haunting story is called I Cannot Carry a Tune. Yes, this is the Music issue...Enjoy! in exalted company, alongside pieces by Sarah, Vanessa and Jim Murdoch. A 93-year-old author who has just had her first book published is to use the proceeds to house friends who she says are currently living "miserable" lives in care homes. What a fantastic story in today's Telegraph - proving that, firstly, it's never too late, and secondly, that all those over "a certain age" aren't just sitting around and idly twiddling their thumbs and waiting for great-grandchildren. I am really inspired by this, good for you Lorna Page! Full article here. Over a 24-hour period at the beginning of this week, I won three prizes in three short story competitions. I won third prize in the Momaya comp, 2nd prize in the Vignette Press short story comp, which they haven't announced yet, and 1st prize in a comp whose details I am not allowed to share until November. I got the email about Vignette Press on Monday morning and I was delighted. That and Momaya are for the same story - Drinking Vodka in the Afternoon, which was broadcast on Radio 4 last year. Funnily enough, just the day before (honest, this isn't poetic license) when i discovered that Drinking Vodka hadn't got anywhere in this other comp, I said to myself, Well, it's a nice story, it's gentle, no fireworks, it's just not a winning story. The universe said something else. When I popped to the Momaya site later that day just to see if they had announced - and assuming that had i got anywhere they would have let me know - my heart almost stopped when I saw my name. I was stunned. I couldn't believe it. All in one day. Amazing. Then, the next morning, when I got the email about the 1st prize for a 600-word story that I wrote a few months ago in my writing group, I was literally blown away. I think my body went into shock. I couldn't do anything, had to watch crap TV and eat chocolate. I wasn't elated, I was confused. I kept thinking, But that story... how could it have...? How could they...? I have told a few people and they say I should be delighted, I have to celebrate, but I am at a loss for how to celebrate. I don't know how to celebrate - I don't drink, what should I do? I think if it had all been spaced out a little more, I could have taken it in, slowly. But it has thrown me - am I becoming one of those "prize-winning" writers that you hear about? But... but..
Stop whinging. It's ridiculous to whinge about this. I am totally ashamed at my reaction. But if I can't do it here, where can I do it? I wasn't expecting this, I didn't think I needed it - the universe whacking me on the head with a frying pan and saying, Girl, you are on the right track. I thought I was doing ok. Ok, is good. Ok is safe. Now I have to shift my thinking, shift gears or something. I will close on the ecstatic note I should be hitting - it's GREAT in terms of publicity for my book, GREAT in terms of the money which will pay for my travel to the La Muse retreat GREAT because Drinking Vodka is the first Mary Margaret story and part of my project for the writing retreat is to keep writing about her and this gives me a fabulous push, GREAT because the 600-word story will be in the flash collection I am working on so that gives that a push too. Great. It really is great. There's obviously something wrong with me because I am not jumping up and down. Jump. Jump! The Short Review Issue 10 Aug 2008 - competition! A truly international theme: three collections from Down Under, Chinese short-shorts in honour of the Olympics, stories of Filipino Americans. Also: two shots of science fiction, two authors with middle initials, a "bracing" anthology and a liberal sprinkling of fabulist fantasy. All available at The Short Review. And here's your chance to win one of this month's books: Paddy O'Reilly's stunning debut collection The End of the World. Visit The Short Review blog for more details. I managed to beat the odds by finding an agent and a publisher for my own first novel. All seemed to be going well until, about six months before publication, my editor called to discuss the issue of blurbs. For the paperback version of my book, I'll have plenty of reviews with which to lard the back cover but, pre-publication, the first-time novelist needs quotes like "Genius!" or "Masterpiece!" or "Johnson writes like an angel!" from other, more established, writers in order to lure potential readers. Thus commenced the dreaded search for blurbs. A very amusing, bittersweet article in Salon about the dreaded "blurb" hunt, which I am familiar with. It's not enough to have attained the book deal, now you have to deal with the naked spaces on the back of the book jacket and try and persuade people to glow and praise your writing. I am lucky, I found three wonderful writers who did just that, and I am very grateful to them. But there's something vaguely humiliating about even asking - it's like saying "Say something nice about me, please!" Then they do, and you're thrilled, but somewhat disbelieving that this describes your writing. A very odd aspect to publishing. I presume originally the quotes were from reviews of the hardcover which they then added to the paperback, but now books often go straight to paperback, hence this strange, artificial process. I don't quite believe it will boost my readership at all... we will see. Anyone else have tales of the dreaded search for blurbs?